Here is what I liked about using this Anti-wrinkle cream. My favorite thing is that I didn’t have to use a ton of other products with it. No additional moisturizer or day or night cream. It makes my beauty routine shorter. I liked how thick it was and that it absorbed nicely into my skin. It was not oily. It had a light scent but nothing over powering. It is safe for all skin types and should start seeing visible results in 2 to 4 weeks and continuing improving for 12 weeks. I am on week 2 and my skin is soft and looks hydrated not oily. 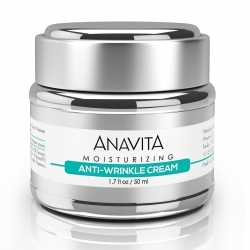 If you would like to try Anavita Moisturizing Anti-Wrinkle Cream you can purchase it on the link below from Amazon.com.